While silver seems to be a favorite for wedding themes, don't be boxed in by tradition. You may do your charm in any finish! Place your charm on the flutes used to toast the bride and groom. Some clients have tied charms to their invitations. Some clients wish to give out fewer than 100 gifts. 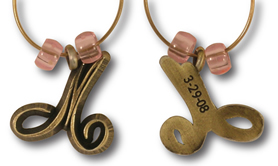 For those clients we recommend packaging your custom charms in sets of 4, 6, or 8. That way you can do 25 sets of 4 and still reach the 100pc minimum requirement. Ask your salesperson for details. Congratulations on your engagement! We know you have a million things to plan - but you've made a wise choice to consider custom wine charms for your table. Custom wedding wine charms are a lasting keepsake that your guests will take home and will recall your special day for years to come. Each wedding wine charm is as unique as the couple that it celebrates. We have done hundreds of custom designs for couples around the globe. If you have a design in mind, please send it along. If not - just let us know and we'll brain storm with you. Either way, we'll help you design a charm that will be the talk of your reception. 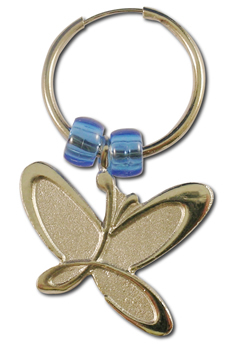 In addition to custom charms, we offer a variety of stock wedding wine charms. Just ask your sales associate for details. "Just got back from our honeymoon and wanted to let you know that our guests are still talking about the charms. We'll never forget that day and the charms were a big part of it." Russ & Erin wanted a simple charm with an interlocking heart motiff and their wedding date. They did their charms in two finishes, antique pewter and antique brass (shown here) to add variety on the tables. Extras: Color fills 0.40 each. Polished and sandblasted finish $1.20ea. Back side engraving $60 setup - no charge per piece.